This is an unwritten post, a silence, a caught in the throat, the words in my head, the left unsaid. The scratched out, the scribbled, the scrunched-up, the came to nothing. Doodles in the margins, around the edges. Gazing out there, up there, beyond here. A quick game of Hearts, a glance at Facebook, Twitter. 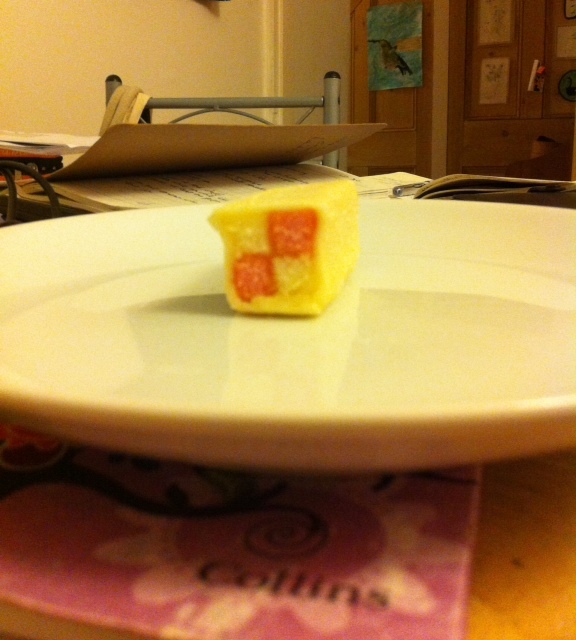 A cup of liquorice tea, a mini Battenberg. Portrait of a fountain pen as a drumstick, a cheerleader’s baton. And when the nib made a hole in the page it must have looked like the Alien bursting through Sigourney Weaver’s stomach. Reflecting on the destructive nature of weariness, the unsurprising spirals of doodles, the disappointment of bite-sized cakes. The post that never was, the unfinished sentence, the trailing off into….the losing track….the lack of focus…. the change of heart. Space where a post should be. A gap. An unfilled sandwich. An empty tea cup. An unpoured drink. When I think of something, I’ll be back. Excellent prose poem. Thank you. Very poetic – out of nothing came……..something good! Very good, I can relate to this, I know the feeling. Love it. Grabbed me by the throat. I really liked this – I loved the feel of almost but not quite it has! Plus I have to say your ‘ not quite a post’ is much more enjoyable to read than the ones I write which actually MAKE IT to be posts – I dread to think what my ‘not quite a posts!’ Would be like! 😀 Thanks for a lovely comment, Col! I think that, with our busy lives, every day contains SOME not quite there moments. I wish I could write that well when I have nothing to write about! Ditto the other comments… we are writers. There’s nothing else to do but write! Thanks for commenting 🙂 Hope you get started again after the stopping! In my life I had never read a poem in English. It’s is so beautiful when you can understand. I like the words that you used to say “for now I can’t write”. But you write about the truth and it is beautiful.